Nando's was one such turn in our trip to the UK. We did eat fish-n-chips and lots of yummy Indian food etc etc.. but the chicken wings at Nando's with the extra-hot peri-peri sauce was the most memorable food moment. When I read that Nando's peri-peri sauce is made from African bird's eye chili with a Portuguese style recipe I was like "whoa??" After not-much googling I figured it was Portuguese influence from colonial times that resulted in the recipe. Anyway - this sauce is tangy, garliki, hot .. oooh.. just perfect for a nice chicken drumstick (tangdi). BTW - you can buy these sauces online or in store. In Pune (India) grocery stores that sell non-Indian spices seem to carry this sauce and.. as it turns out, Nando's also has a restaurant in Mumbai and in Baltimore!! Add Nando's peri-peri marinade to the drumsticks, mix well. Keep it covered in the refrigerator for 24 hours. When you are ready to bake the chicken, heat the oven at 400 F. Add 3-4 cups of water to a 1 inch deep baking tray and place a large wire mesh on top of the baking tray. Place the drumsticks on the wire mesh. This way the water does not touch the drumsticks and doesn't dilute the flavor of the sauce, but the steam from this water will make the drumsticks extra juicy and tender. Place the tray in the oven for 25 minutes or so. I suppose it should be ok to steam the drumsticks instead of baking in an oven - but I have not tried it. 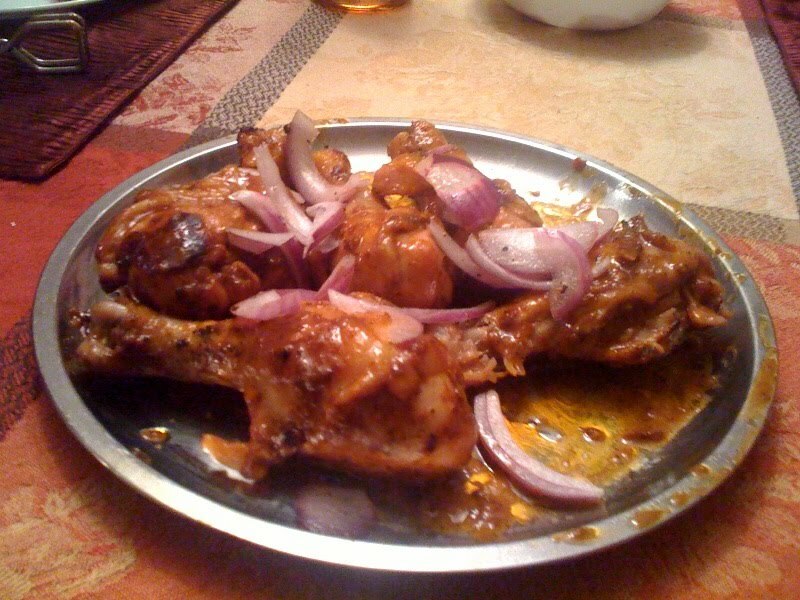 Once the drumsticks are cooked, heat a cast iron tawa or a flat pan on medium heat. Add 1 tbsp of oil and place the cooked chicken drumsticks on the pan. Heat the coal piece on the side and once it starts giving out smoke, place it on the pan and cover the pan. This will give a nice smokey flavor to the chicken. Serve hot with extra-hot peri-peri sauce. What would you do without Google!! @Ketaki - yippi.. let me know how it turns out.. I did not get any time to buy chicken, I had some frozen jumbo shrimps. Heated some oil, added the sauce and let it bubble a little, added the shrimps and after they cooked, let the shrimps sit for a while in the goodness. Before eating, heated it again and served it with cut onion and poli.. It was divine! :) sounds like a nice and quick way to use Nandos.. I will try this out soon.